Linear accelerators from the same vendor in a radiation therapy center are usually beam-matched following Vendor's acceptance criteria. This protocol is limited to check the difference at particular points on the ionization curve for depth dose or beam profiles. This article describes different tests done after commissioning to evaluate the level of agreement between matched beams of two ONCOR Impression plus linear accelerators from Siemens. 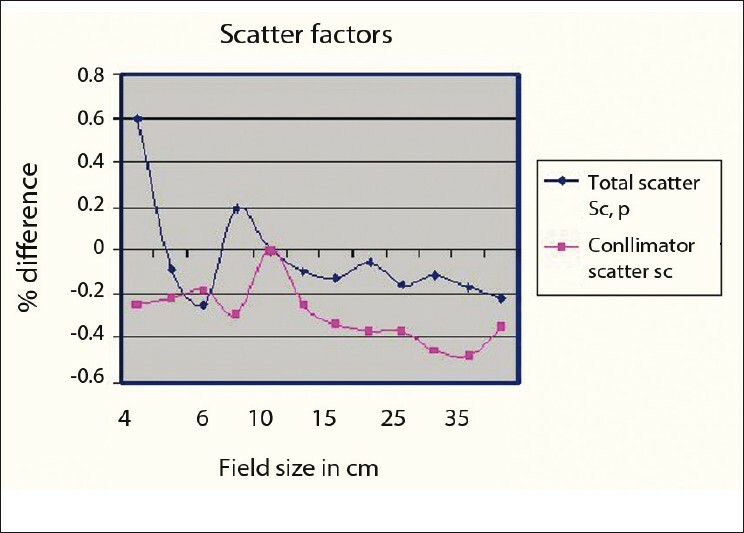 Total scatter factors, collimator scatter factors, wedge transmission factors were measured in water for 6-MV photon. All these factors for ONCOR2 were within ±1% of those values for ONCOR1. Along with these point dose measurements we have essentially used γ-index to compare the planar dose distribution from two beam-matched accelerators. For this study a set of ready packed EDR2 films was exposed on both accelerators. The set consisted of films for percentage depth dose, beam profiles, a pyramid shape, multileaf collimator's positional and dose delivery accuracy, and a film to compare head scatter at tray level. To include treatment planning system calculations, a film kept in axial plane was exposed to 3DCRT and IMRT plans with actual gantry angles and monitor units. These films were analyzed for γ in OmniPro IMRT software using different combinations of ∆dose and - ∆distances. All these films have shown good agreement for - ∆distance of 3 mm and ∆dose of 3 %. Presently many radiation therapy centers are equipped with two or more linear accelerators. If they are from the same vendor then they are usually "beam-matched". In beam matching approach, treatment beams of the accelerator being installed are tuned in such a way that the dosimetric characteristics meet the reference values within a specified interval. The dosimetric and mechanical measurements done during commissioning of first unit are taken as baseline values  and other units are tuned with it. Beam matching reduces the need for the remeasurement of dosimetric data for the treatment planning systems(TPSs). Having beam-matched accelerators also increases flexibility in patient treatment delivery on any unit without any change in the treatment parameters. There are many publications available in literature describing about beam-matching results of Varian accelerators. 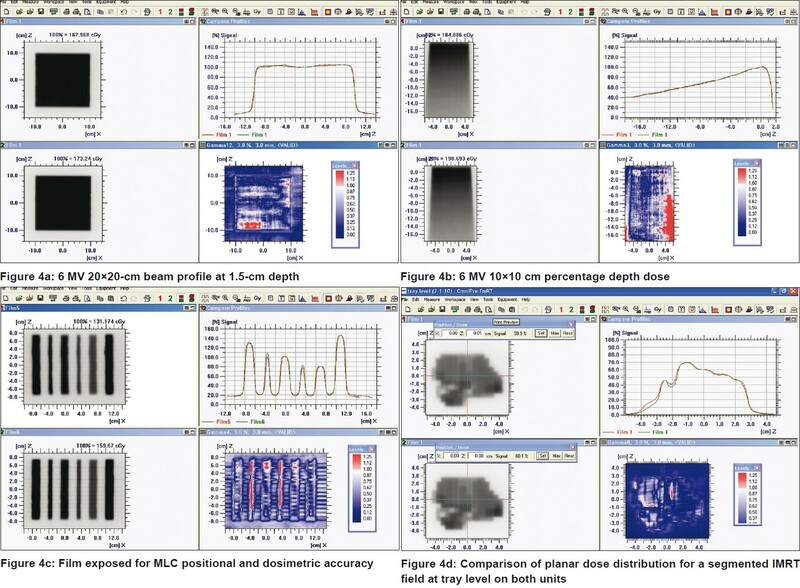 ,,, These articles have confirmed good dosimetric matching of similar accelerators. But similar work done with Siemens accelerators is not available (or reported) in literature. We have a Siemens ONCOR Impression Plus accelerator with 6 and 15-MV photon energies and 6, 9, 12, 15, 18, 21-MeV electron energies. Last year we commissioned another ONCOR Impression Plus with 6-MV photon and all electron energies similar to first ONCOR. It was beam-matched with the first accelerator. There was a time gap of almost 4 years between the commissioning of these two similar accelerators. So the consistency of dosimetric parameters of ONCOR1 was evaluated before using it as a reference data for beam-matching procedure. Vendor's acceptance criteria for the beam matching are limited to evaluate the difference at specific points on the ionization curve for depth dose and beam profiles. The entire curve is not used to evaluate the quality of beam matching. This work describes about different measurements and tests done to evaluate the extent of beam matching. In addition to all routine tests required for commissioning, we have essentially used γ-index to evaluate the level of agreement between the matched beams by comparing  the planar difference. These tests included comparisons at specific points, along lines and planar comparisons. Depth dose and beam profile scans were measured using Siemens scanning equipment (buddleship) for all energies on ONCOR1 to confirm its consistency with the scans taken at the time of its commissioning. These scans were used as a reference for tuning of radiation beams of ONCOR2. As per vendor's acceptance criteria treatment beams for ONCOR2 were tuned within ±1% of ONCOR1 beams. After completing acceptance tests, we performed a set of tests to evaluate the level of beam matching. The tests consisted of specific point dose measurements, profile measurements and planar measurements. These tests are described below. Scans for percentage depth dose and inline-crossline profiles were measured on ONCOR2 with BluePhantom radiation field analyzer (RFA) and analyzed in OmniPro-Accept software (V6.5A). For 6-MV photon beam percentage depth dose (PDD) and inline-crossline profiles were recorded for square filed sizes of 3, 4, 5, 6, 8, 10, 12, 15, 20, 25, 30, 35 and 40 cm. For electron energies from 6 to 21 MeV PDD and inline-crossline profiles were measured for applicator size from 5X5cm-25X25cm.These scans were measured to crosscheck the tuning of radiation beams on the two units. Total scatter factors were measured in water phantom for field size from 4x4-40x40 cm using a 0.65-cc chamber at 10-cm depth. Collimator scatter factors were measured in column phantom for field size from 4x4-35x35 cm with a 0.13-cc chamber at 10-cm depth. Wedge transmission factors were measured in water phantom for square field size of 5, 10, 15, 20 and 25 cm using 0.65-cc chamber at 10-cm depth. for 15, 30, 45 and 60° wedges. Along with the point measurements we have used γ-index , to analyze planar differences using film dosimetry . For this study, a set of ready packed ERD2 films was exposed on both units. These exposures were again divided into two parts. PDD for 10x10-cm field size. Films for beam profiles (5x5, 10x10 and 20x20 cm) at d max . 10x10-cm beam profile at 0.5 and 10-cm depth. 10x10-cm beam profile at 10-cm depth for 30° wedge. A diamond shape of 15x15 cm. For the clinically used electron energies i.e. 6, 9 and 12 MeV, films were exposed for beam profile of 10x10-cm applicator size at d max . A pyramid shape created with field-in-field of 10x10-cm exposed to 100 MU and 5x5 cm exposed to 150 MU. To analyze positional and dosimetric accuracy of multileaf collimators, a pattern of strips was exposed. It consisted of six strips each of length 15 cm and alternate width of 1 and 2 cm. Gap between two strips was of 1 cm. All six strips were exposed to different monitor units from 100 to 200 MU. A film was exposed to a segmented IMRT field at tray level to compare the head scatter. The length of the smallest segment becomes 0.56 cm at tray level. In order to include TPS calculations,  a film kept in axial plane in IMRT phantom was exposed to a 3DCRT plan and to an IMRT plan with actual treatment parameters (i.e. gantry, table, and monitor units). Point dose was simultaneously measured using 0.13cc chamber. All films were scanned using Vidar DosimetryPro scanner and analyzed in OmniPro ImRT (V1.7) software. Dosimetric data measured during acceptance of first unit was taken as baseline data. As per Siemens acceptance test protocol (ATP), goal of beam matching was to get new machine's photon characteristics (energy, flatness-symmetry, and penumbra) and electron characteristics (energy and X-ray contamination) matched to within ±1% of old machine's data, as measured bySiemens scanning equipment. Accordingly scans for depth dose and inline-crossline profiles were collected from ONCOR1 with Siemens scanning equipment (buddleship) for 6MV photon and electron energies 6 to 21 MeV to assure its constancy with the commissioning scans. These scans were used as reference to match beams for ONCOR2 within ±1% of ONCOR1 and following the machine specifications. After completion of ATP, scans were measured for percentage depth dose (PDD) and inline-crossline profiles for 6-MV photon for field sizes from 3x3 to 40x40 cm using Blue Phantom RFA. 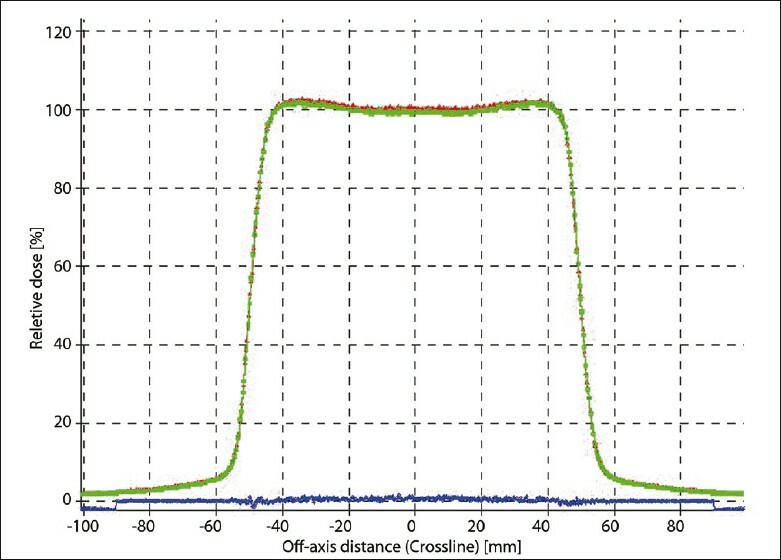 For electron energies 6-21 MeV, PDD and inline-crossline profile scans were recorded for applicator sizes from 5x5 to 25x25 cm. These scans were compared with scans from ONCOR1 in OmniPro-Accept. [Figure 1] shows beam profiles for 10x10 cm field of two similar accelerators overlaid over one another, and the blue line indicates the percentage difference between the two compared profiles. Most of the profiles have shown agreement within ±1%. Total scatter factors and collimator scatter factors measured on ONCOR2 were compared with those from ONCOR1. As shown in [Figure 2], the difference between the two for all field sizes was within ±1%. Wedge transmission factors measured for 5x5, 10x10, 15x15, 20x20 and 25x25-cm field sizes were compared with those from ONCOR1. Wedge factors were calculated by taking ratio of average of thick end in and thick end outreading to the open field reading. For 15° wedges the difference was within ±1% for all field sizes. For 30° wedge the difference was within ±1% for field size of 5, 10, 20 and 25cm. Whereas for 15x15-cm field size it was -1.5%. Similarly for 45° wedges the difference was +1.3% for 5x5 cm; and within ±0.6% for all other field sizes. 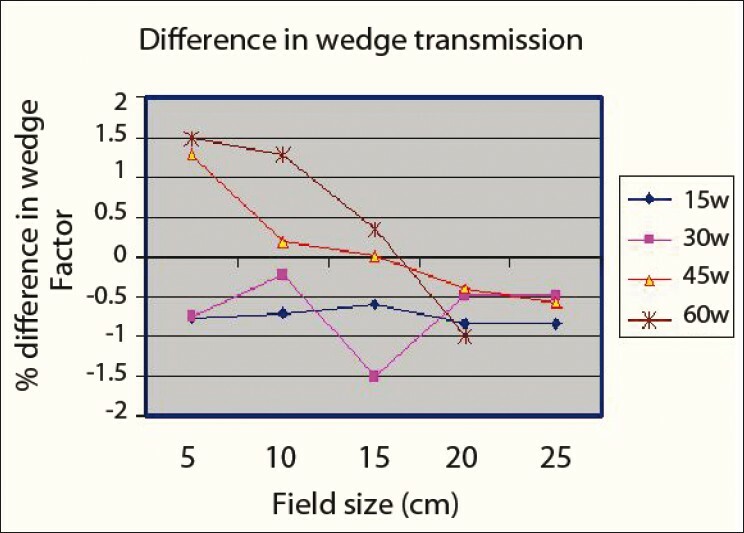 For 60° wedge the maximum difference was +1.5% for 5x5-cm field and it was within ±1.3% for other field sizes as shown in [Figure 3]. As single set of dosimetric data is used for patient treatment on both units, the point dose measurements were done to confirm the agreement between two similar accelerators. Absolute dose measurement for 6-MV photon was done in water phantom for 10x10-cm field size using 0.65-cc chamber for ONCOR2 and was adjusted within ±1% of ONCOR1. Output factors for all clinically usedelectron energies for all applicator sizes were also set within ±1% of ONCOR1 values. The profile measurements are measured along a single line and the point dose measurements are done at specific points. Most of the line and profile measurements were within ±1% of ONCOR1 values. To evaluate the extent of beam matching we have used planar comparisons. For this purpose we exposed a set of ready packed EDR2 films. The set consisted of uniform exposures and modulated exposures. These exposures were done under the same geometry on both accelerators. All these films were scanned using Vidar (dosimetry Pro) scanner and analyzed in OmniIMRT (V1.7). Films from new unit were compared against those from first unit as shown in [Figure 4]. Comparison of 6-MV beam profile at dmax is shown in [Figure 4](a), [Figure 4](b) shows the comparison of PDD on both units. A pattern of strips created with different monitor units at different position exposed at both units is compared in [Figure 4](c). As this pattern was created using six strips with a gap of 1-cm between two strips; the comparison also included the interleaf MLC transmission for both units. This pattern was designed to include over travel of both X1 and X2 jaw. The measured value of MLC transmission on ONCOR2 was also within ±1% of ONCOR1 value. A film was exposed to a segmented IMRT field at tray level to compare head scatter from both machines. This comparison is shown in [Figure 4](d). The segment size was minified to 56% of its size at isocenter level with the same intensity peaks. When performing γ evaluation one distribution is taken as 'reference' and another is taken as 'measured' or 'evaluated'. γ-index iscalculated based on difference in dose and difference in distance to agreement (DTA) relative to the acceptance tolerances as described by Low. γ was calculated with different ∆dose and ∆distance for all tests.Dose distribution from ONCOR1 was taken as 'reference' distribution and dose distribution from ONCOR2 was 'evaluated' against it. The evaluated distribution passes γ if the difference in dose and difference in distance compared with the reference distribution is within the passing criterion . All these comparisons have passed γ for 3% and 3-mm setting. It indicates that the difference in dose was within 3% and difference in DTA was within 3 mm for the comparison.Most of them have shown good agreement for 2% and 2 mm condition also. There are different methods available in OmniPro ImRT software to analyze the γ evaluation. We have used Standard histogram generated to analyze the γ distribution. Standard histogram gives a graphical representation of number of pixels having a particular γ value for the selected region of interest. In general, a 3% and 3-mm criterion is good enough for comparison of dose distribution from IMRT plans where as 1% and 1-mm is rather strict criterion for acceptance. [Table 1] shows the analysis of standard histogram in terms of average signal (Γavg ) and standard deviation (SD) for different settings of -dose (∆D) and λ-distance (∆d). From [Table 1], it can be noted that as more strict conditions are set for γ evaluation the value for average γ signal is increased. For this comparison film developing was one of the major affecting factors. Even though the exposures were performed under same geometry with same monitor units, and the evaluation conditions (setting of origin, ROI selection) were same; poor film developing has affected few comparisons. To overcome this problem, few tests like PDD and small-field profiles were also done with GafChromic films.The need for film developing was eliminated with the use of GafChromic films. Comparisons done using GafChromic films have shown average γ signal as low as 0.2 even for a tight tolerance conditions like 1% and 1 mm. As two units are beam-matched, a single set of dosimetric data is used for TPS calculations for treatment on both accelerators. In order to take TPS data  into account absolute dosewas measured in IMRT phantom for a 3DCRT and an IMRT plan with actual treatment parameters (i.e., gantry, couch and monitor units). For both plans the difference in absolute dose was less than 1% compared with first unit; whereas it was within ±3% from TPS value on both units. Delivered fluence obtained from EDR2 films kept in axial plane for these exposures also have shown goodagreement with optimized fluence from TPS as the correlation coefficient was 0.99 for both units. Vendor's acceptance conditions for beam matching are limited to evaluate specific points on the ionization curve. This work was done toevaluate the extent of beam matching between two Siemens ONCOR Impression Plus accelerators at specific points, along lines and along planes.To sum it up, 42 point dose measurement data was used for comparing the beam matching, out of which, 38 measurements were within ±1%, whereas only 4 point dose measurements fell within ±1.5%. Totally 43 PDD curves were compared (including both photon and electron beams) and none of the comparison showed deviation greater than 1%. Profiles numbering 86 were compared and there differences also were below 1%. Five modulated planar exposures were compared out of which four had shown average γ less than 1.0 and one exposure had shown average γ-value as 1.11. Totally, 11 unmodulated planar exposures were compared and all of them have shown average γ-value less than 1.0. One unique attempt has been done to compare the IMRT fluences at the shielding tray distances, which make the comparison rigorous as the MLC leaf width reduces to 0.56 cm. The same intensity gradient is displayed against the reduced spatial axis produced at isocenter. The spatial component of the smallest segment is minified to 56% of its value at isocenter. 1. Hrbacek J, Depuydt T, Nulens A, Swinnen A, Van den Heuvel F. Quantitative evaluation of a beam-matching procedure using one-dimensional gamma analysis. Med Phys 2007;34:2917-27. 2. Klein EE, Hanley J, Bayouth J, Yin FF, Simon W, Dresser S, et al. Task Group142 report: Quality assurance of medical accelerators. Med Phys 2009;36:4197-212 . 3. Watts RJ.Comparative measurements on a series of accelerators by the same vendor. Med Phys 1999;26:2581-5. 5. Marshall MG. Matching the 6MV photon beam characteristics of two dissimilar linear accelerators. Med Phys 1993;20:1743-6. 6. Low DA, Harms WB, Mutic S, Purdy JA. A technique for the quantitative evaluation of dose distributions. Med Phys 1998;25:656-61.